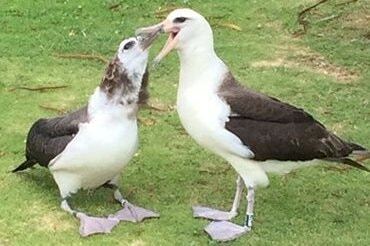 I can hardly wait for the Laysan albatross to arrive back on Kaweonui Road in Princeville. It should be any day now and it is SO exciting when the first one appears overhead. 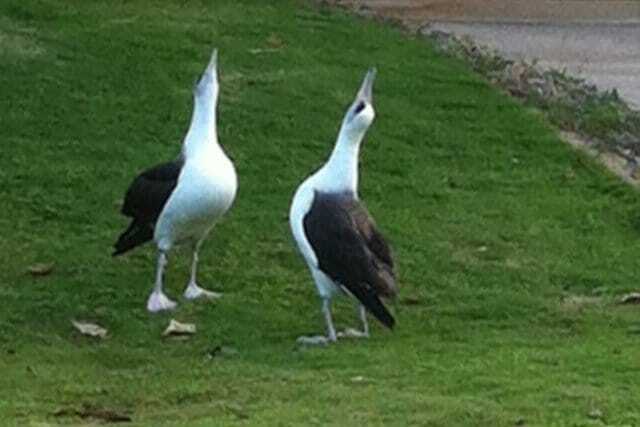 Every year since the late 70s the north and west shores of Kauai have been home to these amazing birds. 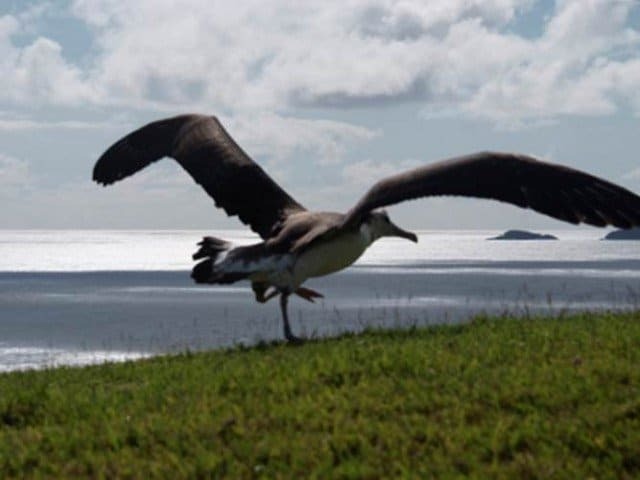 The Laysan albatross fly south from Alaska during the month of November and arrive on island to mate and have their young. It is an exciting time of year for our Princeville neighborhood. 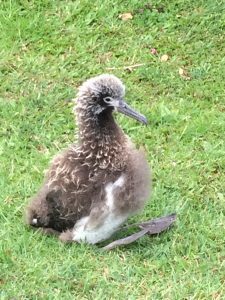 This is because when chicks are born on island they are tagged and named by the resident whose yard was home to the newborn. Neighbors anxiously await to see which adult birds have survived the summer and fall months. The fledglings return to where they were born after three to four years of exploring the ocean. 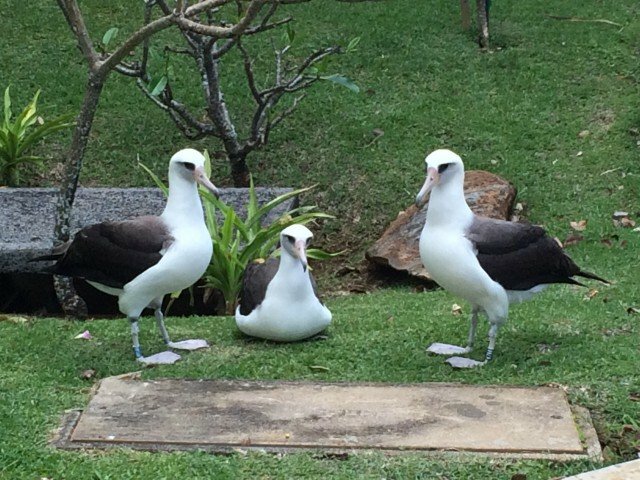 Once back on island albatross couples build their nests in our neighbor’s front and back yards. It is here that the females lay their nine ounce eggs. In 2016 we had five eggs hatch within a block of Honu Point. The parents take turns sitting on the egg for close to two months until the chick “pips” his/her way out. During their time off of the nest the adult birds are searching for food, socializing with others or soaring on the wind currents right in front of Honu Point. These magnificent birds have a wing span of up to seven feet and they glide without hardly flapping their wings. It is a beautiful sight. The three birds here were sitting at the foot of our driveway socializing with many others in the cul-de-sac when I took this photo. Those birds who have not yet found their match do their best to impress. The mating dance is quite entertaining to watch with many high pitched sounds and matching movements done side by side. 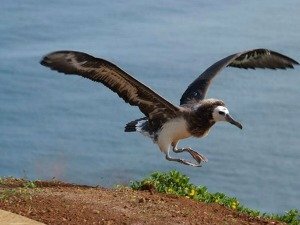 If a Laysan albatross finds the perfect match he/she will commit for life, mate and give birth to a young chick the following year at the same location. The nests are made on the lawns or under bushes in the yards of houses along Kaweonui and Keoniana Roads, as well as other spots within the Princeville Resort area. The following video is one I took of a pair dancing three houses down from Honu Point. I’m not sure if they hooked up or not, but they were definitely trying to impress each other. The chicks are born in January, with layers of fluff feathers, totally dependent on their parents. The adults must fly 800 to 1600 miles away in order to search for food to bring back to them. This round trip takes approximately three weeks at which time the parent regurgitates some food and oil into the baby’s throat for nourishment. The second adult then takes off on the same journey while the first provider rests with the youngster. This alternating schedule goes on for months while the chick matures near its nest and a stream of tourists arrive to take photos of the fluffballs. Eventually the chick starts losing its fluff and develops flight feathers. By July all that is left of the down feathers is a lei around its neck and some scattered on its head. At this time Mom or Dad provides the last meal in order to entice the baby to fledge. Fledglings can be seen practicing wing movement in the yards and in the street within a few houses of Honu Point. It is as if they are trying to understand just how the wind is going to work for them. At some point the youngster decides it is time to find the bluff, even if Mom or Dad are not around. Having never seen the ocean before they finally leave their nest area and start walking around the neighborhood looking for the perfect cliff from which to jump. They generally choose either the point across from Honu Point or our very own bluff, often times walking right down our driveway and around the house. Here they wait for hours or sometimes days until just the right moment to take the giant leap of faith. When they do, eye witnesses hold their breath in hopes that they will catch the wind and soar off over the ocean. From there they must fly the 800 to 1600 miles to search for and catch the live squid and fish eggs their parents have so faithfully been bringing back to them. 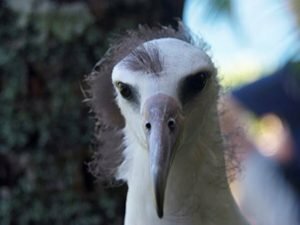 Meet Nash as he flies for the first time …..
Vinney, pictured at the top of this blog, was one of the fledglings who chose to fly off the bluff right outside the master bedroom at Honu Point in 2015. Hopefully Vinney is alive and well but we will not know for at least one of two more years. These birds can process salt water through their nasal cavities and therefore do not return to land for a least three years. We have our fingers crossed that we will see Vinney again in the fall of 2018 when he comes back to Kaweonui Road to find his mate. In the meantime we will welcome all the others in November when they return from their northern journey to entertain us all on Kaweonui Road. I can’t wait. I love these birds!